St Cybi's Church is a Grade I listed building, a late medieval church founded long before that, reputedly by the important Welsh saint, St Cybi. It has the rare distinction of standing inside the walls of a Roman fort. Built of brown stone, it was restored by George Gilbert Scott, 1877-79. Its fan vaulting dates from this time. The Stanley Chapel here came later, and dates from 1896-97, but, according to the church's own site, was also to Scott's design. St Cybi's overlooks Holyhead's inner harbour on the Island of Anglesey in North Wales. 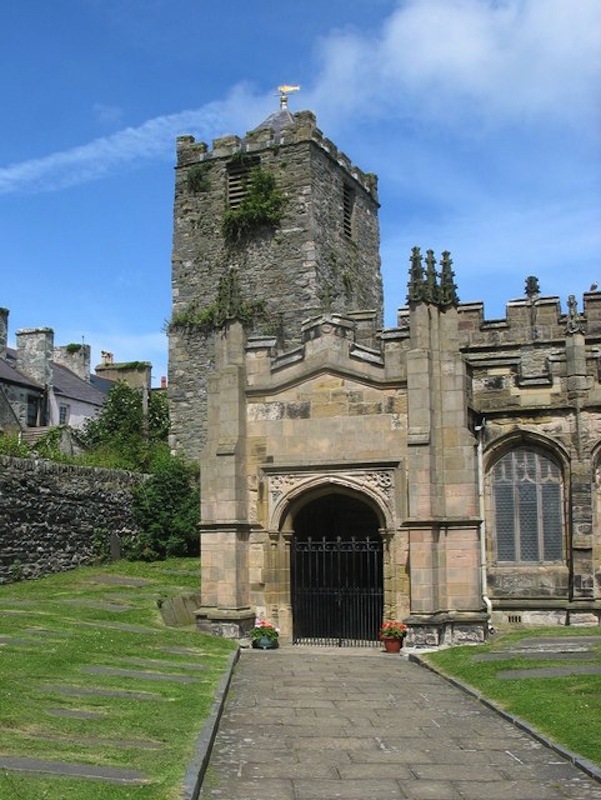 Left: The entrance to St Cybi's Church. Right: The Stanley Chapel. Source: Roberts 51. This is an attractive as well as an historic church, with, despite its much longer history, many points of Victorian interest. Until 2003, there was a statue of St Cybi by Hamo Thornycroft on the exterior of the Stanley Chapel. Although this has since been lost, Thornycroft's beautiful Italian marble memorial to Stanley can still be seen inside the chapel, with angels protecting the effigy. The Hon. William Owen Stanley (1802-1884) was a patron of the church and a member of the illustrious Stanley family, who had been "M.P. for Anglesey, 1837-1847, for Chester, 1850-1857, and for the Anglesey Boroughs, 1857-1874. He was also interested in Celtic Archaeology and wrote many articles in Archaeologica Cambrensis" ("Bangor University Penrhos Manuscripts"). This ancient site could not have been a better location for his last resting place. The chapel is important too for its Morris & Co. windows. One, on the east wall directly over the monument, is of special significance because of its "Tree of Life" design, without any figures (see Crampin), while the other windows in the chapel were created from designs by Sir Edward Burne-Jones and John Henry Dearle. Digital reproduction of the whole of the damaged Morris window. The last Morris factory window was hidden behind the organ and no living person could recall it — our [magnificent eighteenth-century] Lady Eleanor Organ was installed across it in 1932. It was only visible for ten years! Two years ago we had the window removed from behind the organ. It was shattered and in many pieces. The fragments were pictured on a light box and using the computer I assembled the pieces like a jigsaw puzzle, filling in missing parts from similar windows on the internet.... The window is boxed up hoping for future restoration and display on a light box. 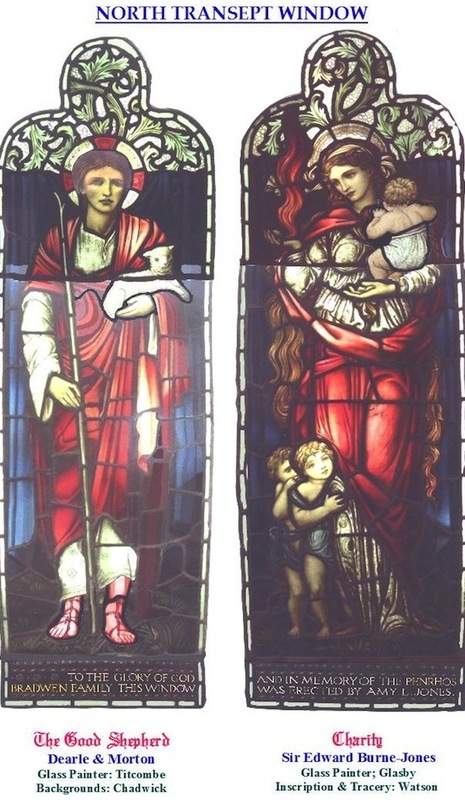 Compare Charity here with the figure by Burne-Jones in St Martin's Church, Brampton, Cumbria. Among the other stained glass windows here, designed by firms established in the Victorian period, is the fine chancel window by Charles Eamer Kempe, though perhaps many people's favourite will be one of the more recent windows, very much later but at least telling of institutions established in the Victorian period. 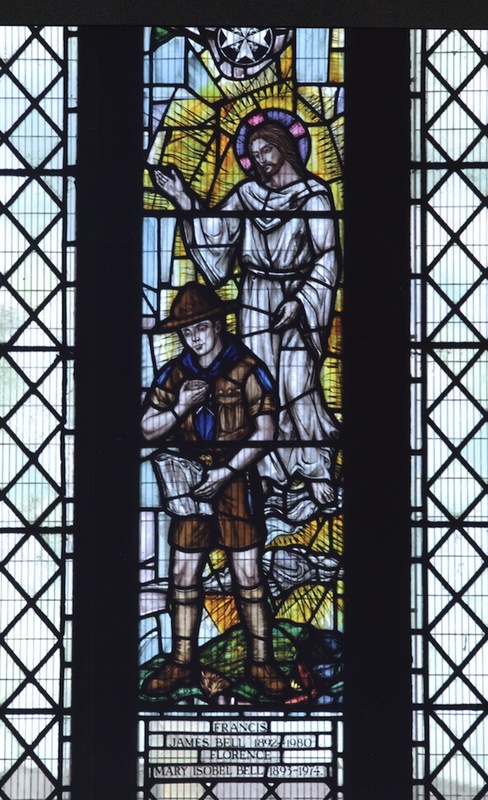 In memory of Mr and Mrs Frank Bell, it was the work of Celtic Studios in 1982, and shows Jesus watching over a boy scout. In the top left-hand corner is the Maltese Cross. Frank Bell was a much-loved Vicar's Warden, Sunday School Superintendent, Scoutmaster (founder of the second cub scout movement in the UK) and St John's Ambulance Officer (hence the Maltese Cross), who died in 1980. Dr Roberts writes that as a young man Frank Bell was on speaking terms with Baden Powell himself, so he provided a real link with the past. "Tree of Life" from Morris & Co.
"Bangor University Penrhos Manuscripts." Archifau Cymru/Archives Wales. Web 12 November 2014. 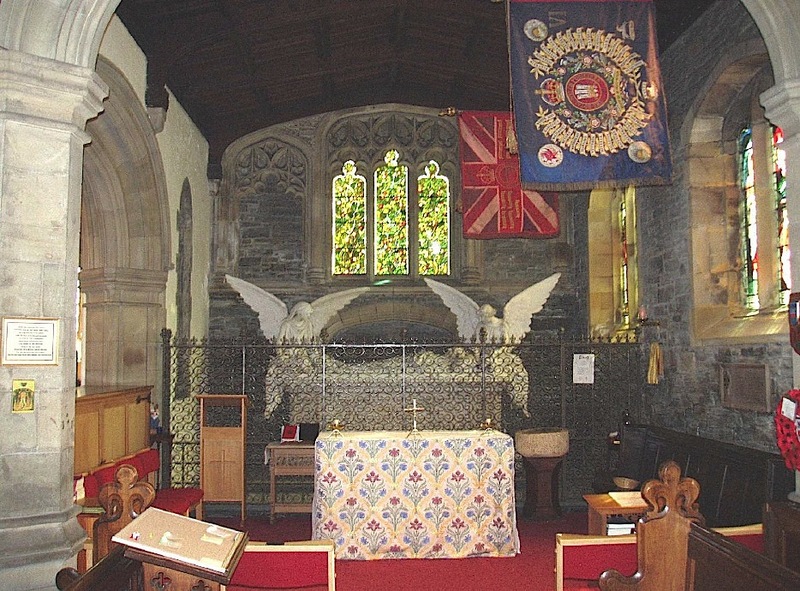 "Church of St. Cybi, Holyhead, Anglesey." Stained Glass in Wales / Gwydr Lliw yng Nghymru. Web. 28 October 2015. Crampin, Martin. "Llewelyn, Siwan and the Tree of Life." Stained Glass from Welsh Churches. Web 12 November 2014. Roberts, Dr. J. K. The History of St Cybi's Church. Holyhead: Anglesey County Council, 2008. Many more details about the church can be found in this book. 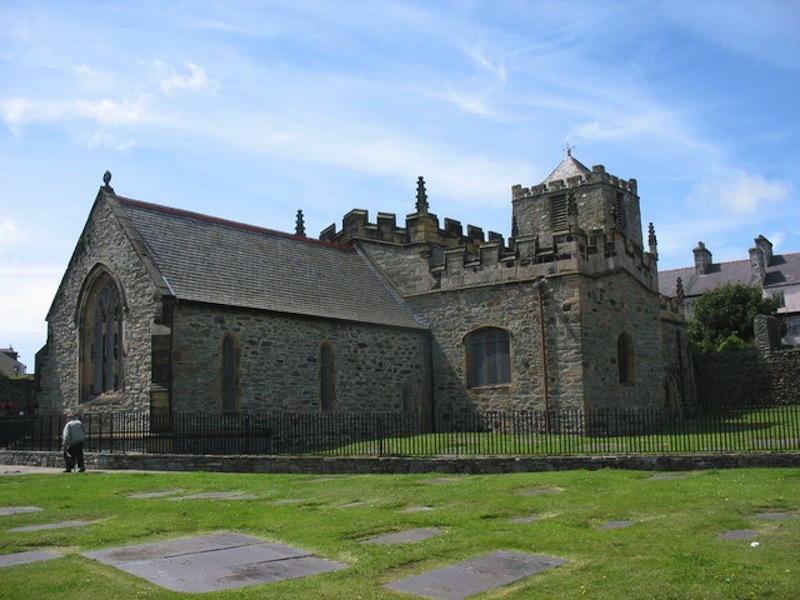 St Cybi's Church, Holyhead. British Listed Buildings. Web 12 November 2014.